The United Kingdom has been a member of the European Union for forty three years. Although EU membership has brought numerous indisputable benefits, anti-EU sentiment, simmering for decades, has now reached the point where an upcoming referendum could quite possibly lead to exit from the Union – an enormously topical issue dubbed ‘Brexit’. 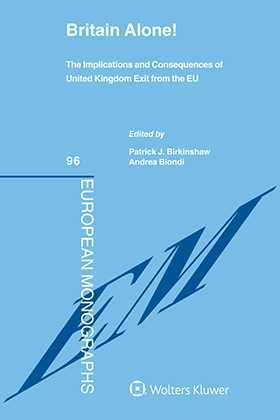 With Brexit becoming the largest single issue to affect the United Kingdom’s place in the world, this volume is certain to be widely read and referenced in the time before, during, and after the referendum. It will also remain of great value as social, political, and economic events unfold in the post-referendum United Kingdom. Introduction Patrick Birkinshaw & Andrea Biondi. CHAPTER 1 Britain Alone Constitutionally: Brexit and Restitutio in Integrum Patrick Birkinshaw & Mike Varney. CHAPTER 2 A Tale of Two Referendums: Scotland, the UK and Europe Stephen Tierney & Katie Boyle. CHAPTER 3 ‘Britain Alone’: A View from Northern Ireland Gordon Anthony. CHAPTER 4 ‘Brexit’ and Welsh Devolution: The Likely Impact Mike Varney. CHAPTER 5 Responsibility, Voice and Exit: Britain Alone? Paul Craig. CHAPTER 6 Which Options would Be Available for the United Kingdom in the Case of a Withdrawal from the EU? Jean-Claude Piris. CHAPTER 7 The UK and the World: Environmental Law Ioanna Hadjiyianni. CHAPTER 8 The EU’S External Relations: A Question of Competence Daniel Denman. CHAPTER 9 Judicial Protection and the UK’s Opt-Outs: Is Britain Alone in the CJEU? Maria Kendrick. CHAPTER 10 Criminal Law John R. Spencer. CHAPTER 11 From EU Citizens to Third-Country Nationals: The Legacy of Polydor Marja-Liisa Öberg. CHAPTER 12 Britain Alone! The Implications and Consequences of United Kingdom Exit from the European Union: Social Policies Aileen McColgan. CHAPTER 13 The Death of Social Europe Keith D. Ewing. CHAPTER 14 The United Kingdom without the Charter of Fundamental Rights of the European Union: Putting Down the Dog That Did Not Bark? Kieron Beal QC. 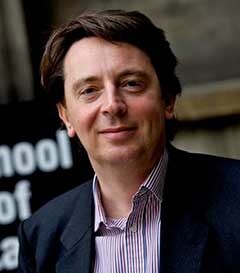 CHAPTER 15 State Aid Control, Government Spending and the Virtue of Loyalty Andrea Biondi. CHAPTER 16 Differentiated Integration and the Single Supervisory Mechanism: Which Way Forward for the European Banking Authority? Pierre Schammo.